The Second ASEAN Autism Network (AAN) Congress was recently held at the Rizqun International Hotel, Abdul Razak Complex, Brunei Darussalam last April 27-29 this year with the theme “Towards Autism-Friendly ASEAN Community”. The organization was established to serve as an effective forum that can work at the national and sub-regional levels to advocate the rights of person with autism. To further protect the rights of Persons with Autism, Autism Society Philippines’ “1Pangako” campaign to stop the use of the word “autistic” in a derogatory manner was given a chance to be heard at the congress. 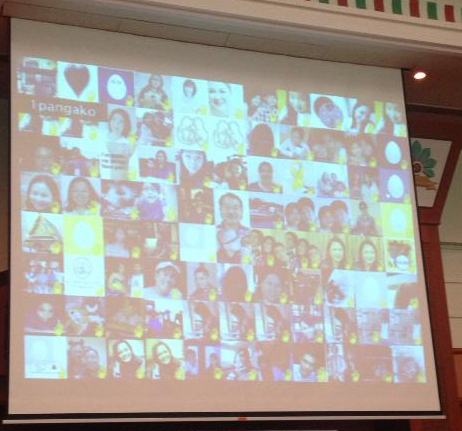 The campaign, which was launched nationwide in January 2013, aims to reach a million Filipinos with this message of compassion through live events and digital interactions. The English version of the 1Pangako campaign song, written by ASP Board of Trustee Ms Gina Luna Bermudo, was played alongside the nine member ASEAN countries’ presentation, where each representative made a 15 minutes report regarding their own experiences of living with person with autism. Mr. Akii Ninomiya, Executive Director of The Asia-Pacific Development Center on Disability (APCD), gave a nod of approval to ASP's multi-faceted digital campaign. When the campaign song was played, Mr. Ninomiya even got down from the podium where he was seated to have a full view of the video. The lyrics touched the hearts of almost 800 regional delegates from Brunei, Cambodia, Indonesia, Laos, Malaysia, Myanmar, Philippines, Thailand and Vietnam in the Sutra Ballroom of Rizqun Hotel. Emotions were high and participants were teary eyed after they heard the song. In response to the campaign, all the delegates collectively recited the “1Pangako” pledge with a promise to support the campaign by starting with themselves; and to help the entire autism community in making this world a better place for children with autism to live a life of dignity and pride.